Doing an excursion with food included is often a treat in Italy — as it was when we went on a boat tour of the Gargano peninsula in Puglia during our last vacation there. 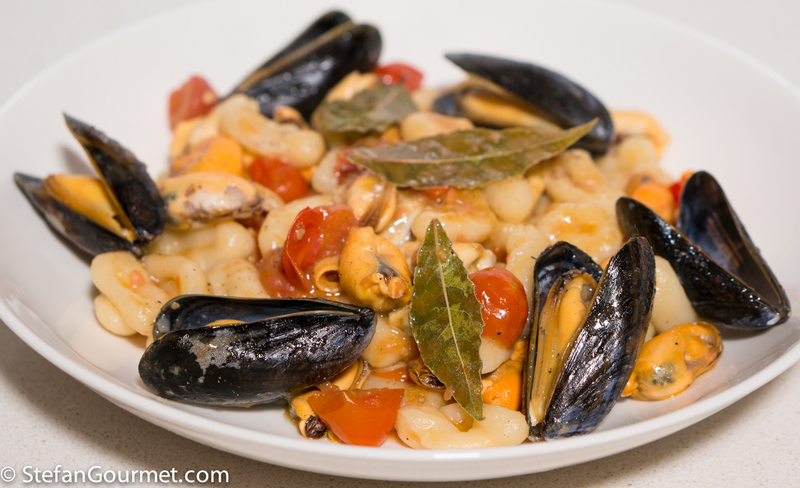 The pasta served for lunch was cavatelli with mussels, tomatoes, and bay leaves. The bay leaves added a very nice fragrance to the dish. 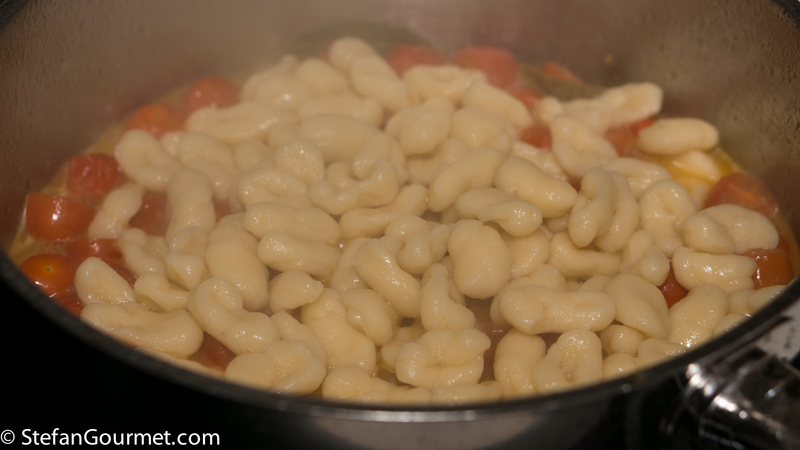 Since cavatelli are hard to find in shops around here, I decided to make them myself from scratch. 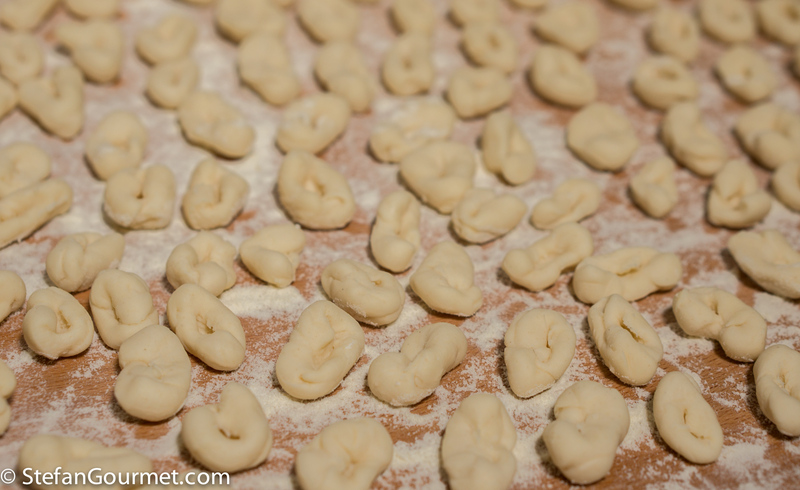 Please note that the term cavatelli is also used for a larger and more elongated version of the same basic shape. As with all fresh pasta in the South of Italy, the pasta dough is made from durum wheat flour (semola di grano duro rimacinata, sometimes mixed in equal proportions with farina di grano tenero 00) and water only (no eggs). If you don’t feel like making handmade pasta, you can still enjoy this dish by substituting with any store-bought short pasta shape such as orecchiette, penne or farfalle. 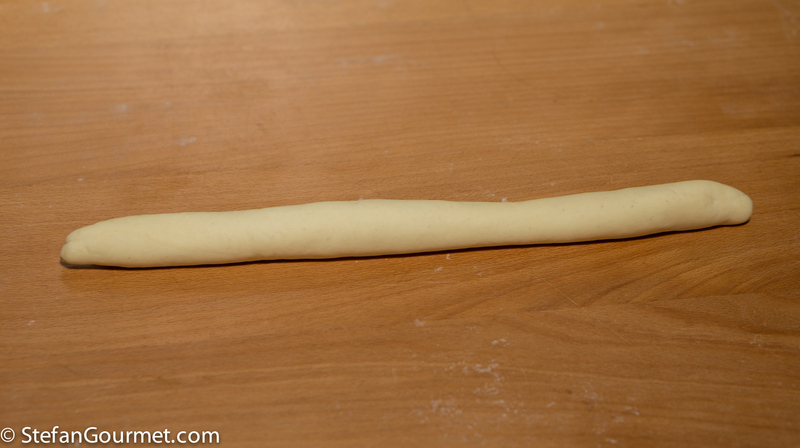 Make the pasta dough as explained in this post, allow it to rest for half an hour (wrapped in cling film), then take a piece of pasta while keeping the remainder wrapped to avoid drying out, and roll it out into a thin sausage with your hands. This is easiest on a wooden work surface that has NOT been sprinkled with flour. 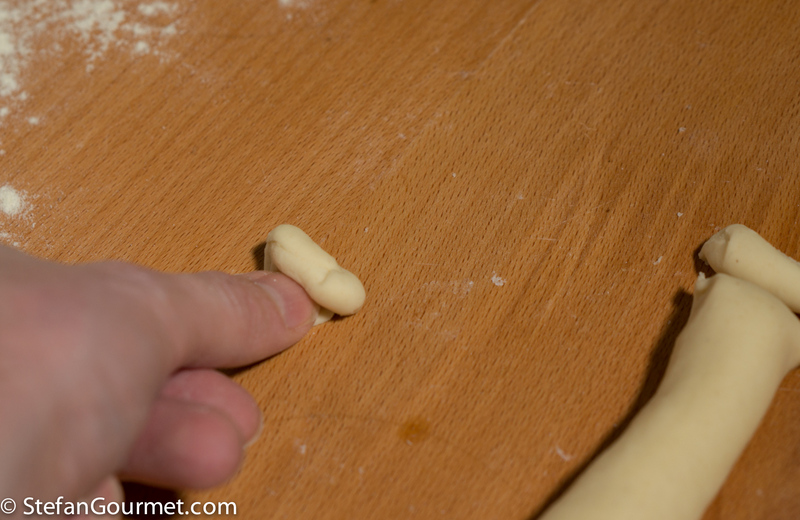 …and roll each piece under your thumb to make cavatelli. It is much easier to watch on YouTube how to make them than to try to describe the process. 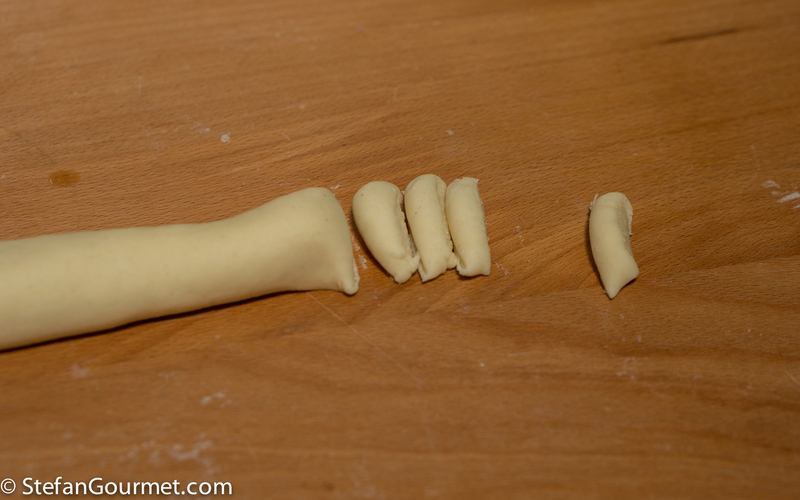 To make the more elongated version of cavatelli, the pasta dough is first rolled out in thick sheets, then sliced into rectangles, and then rolled under three fingers. It is quite a bit of work to make cavatelli for two, so arrange for some assistance if you’re making this for a crowd. Although I haven’t tried it myself, I bet children would love to help with this. 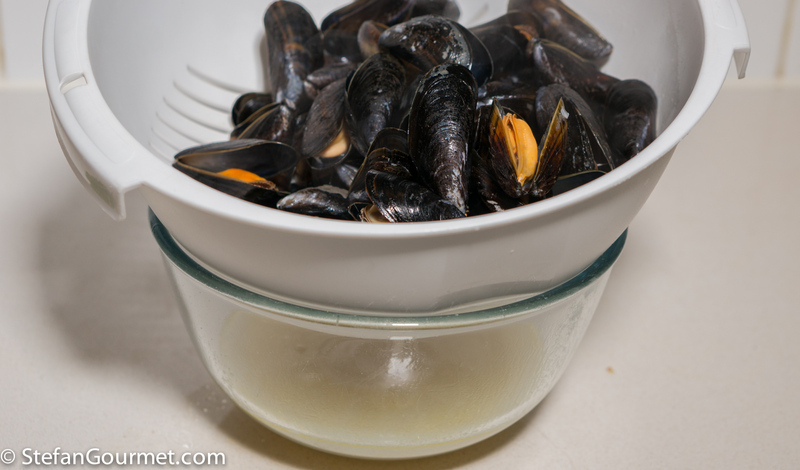 To make the sauce, clean the mussels (discarding any that are not closed) and put them in a saucepan with the white wine. 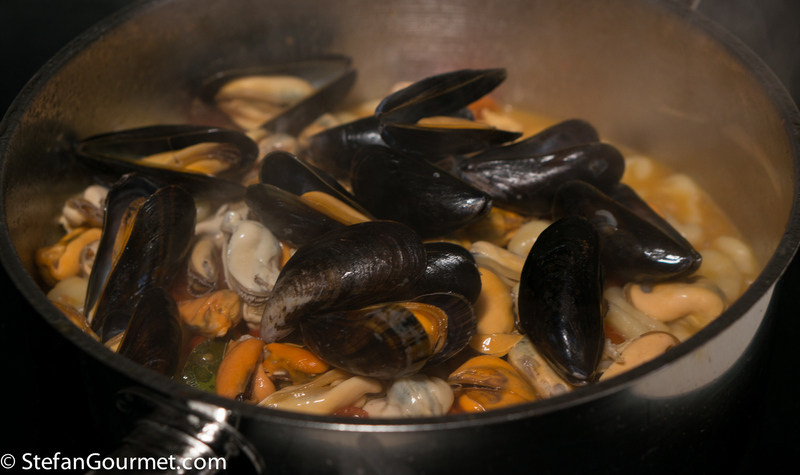 …until the mussels have opened. 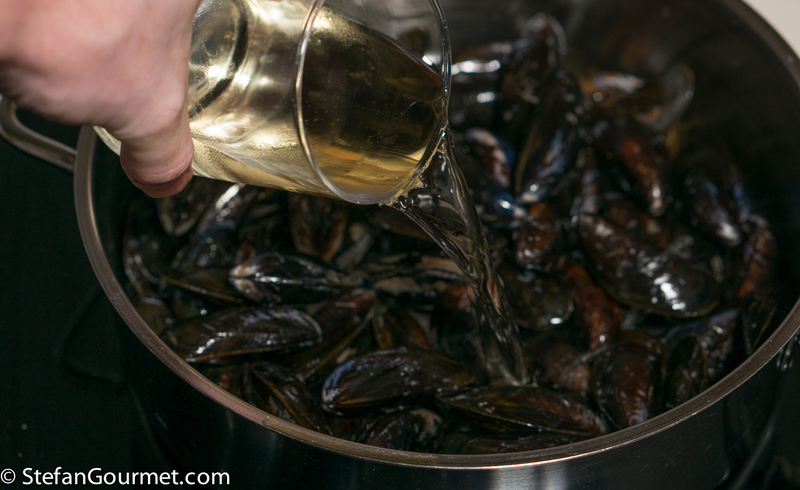 Do not cook the mussels longer than necessary, because that would toughen them. 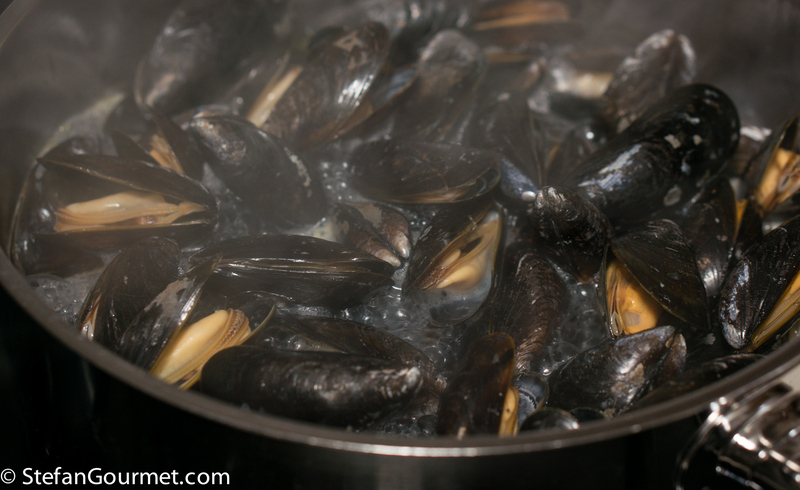 Use a colander to catch the liquid released by the mussels during cooking into a bowl. 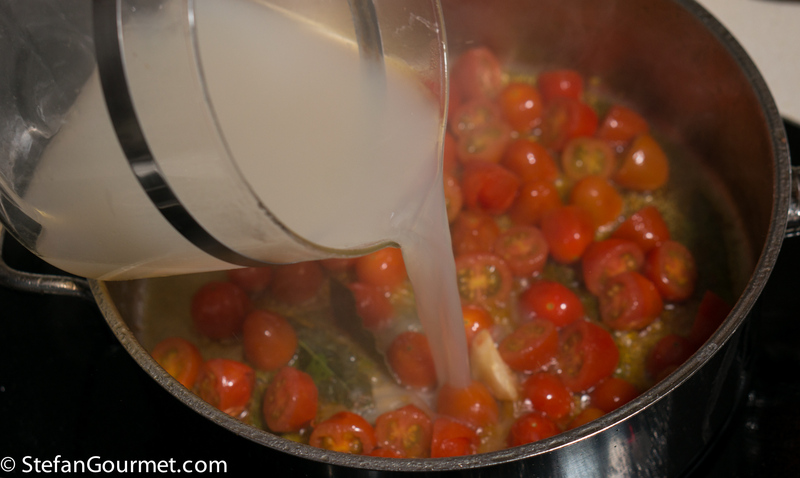 Bring a pot of water to a boil. 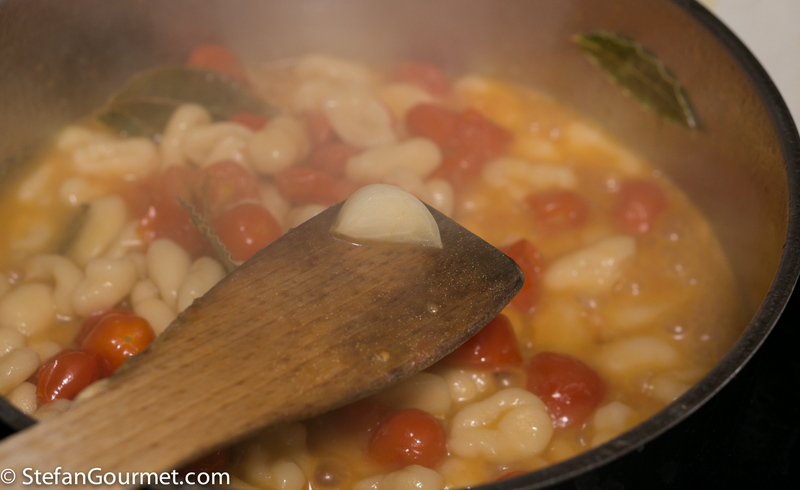 Add the cavatelli pasta as soon as the water boils. 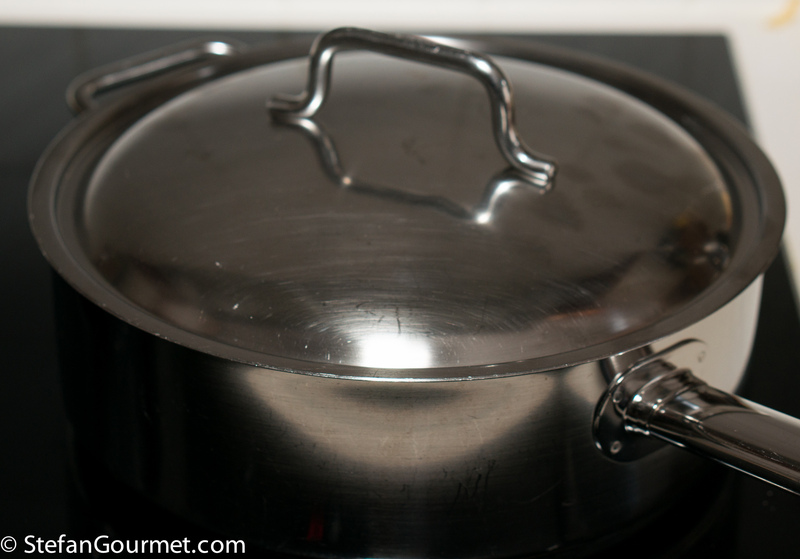 The cooking time depends on how thick you made them and how soon you are cooking them after you made them (as they slowly dry out and will take longer to cook), but expect 6 to 8 minutes and taste for doneness. 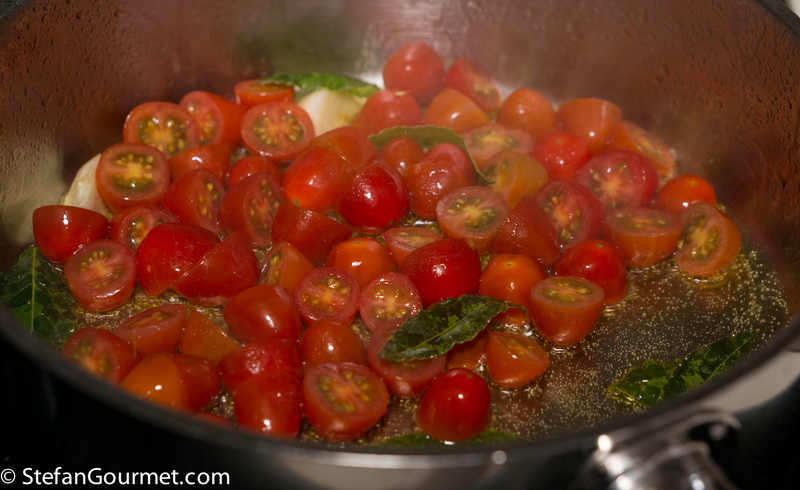 In the meantime, heat two tablespoons of olive oil in a frying pan. 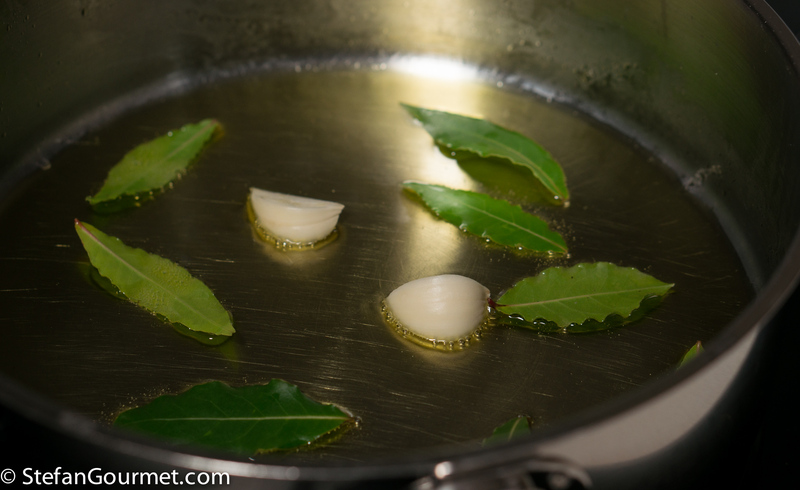 Add the bay leaves and the garlic, peeled and left whole or cut into 2 or 3 pieces. 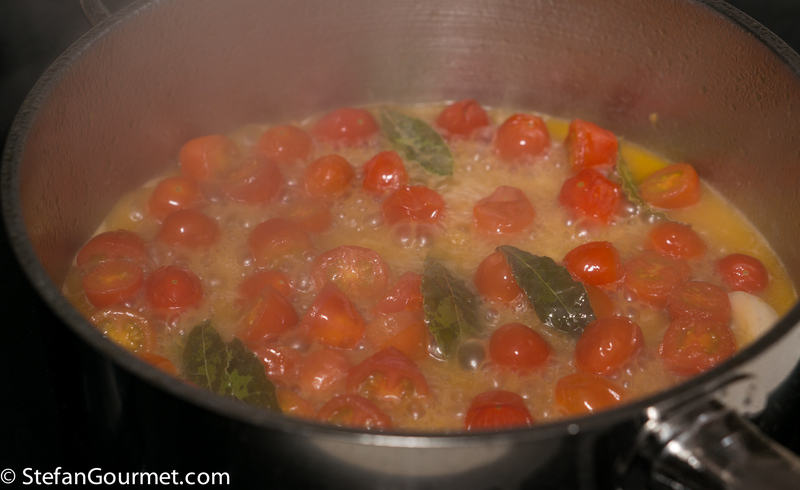 Add the cherry tomatoes and cook over medium-high heat for a couple of minutes. …and bring to a boil. 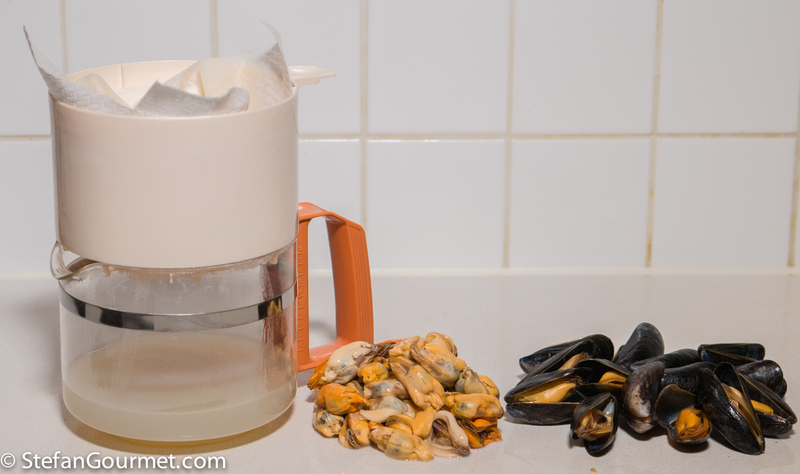 Allow the mussel liquid to reduce over medium-high heat for a couple of minutes. When the pasta is almost al dente, drain it, and add it to the sauce. Stir the pasta for a minute in the sauce, and discard the garlic if you encounter it. 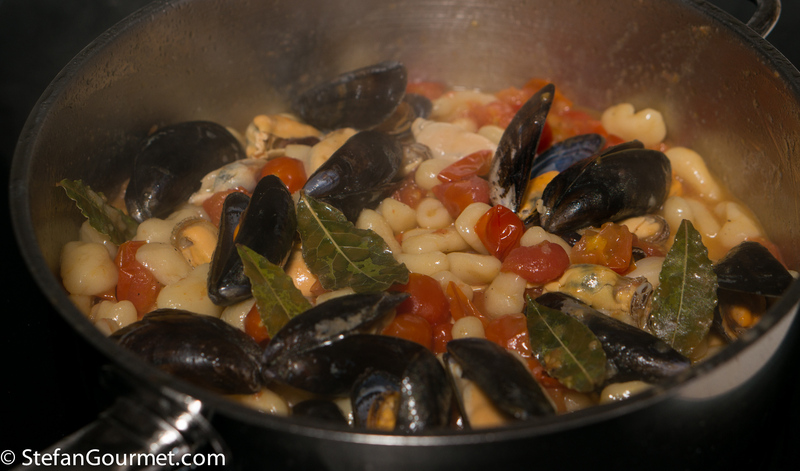 You could add some more of the reserved mussel liquid, but taste first because it may already be too salty. …and toss to mix. Season to taste with freshly ground black pepper (and salt, if needed). Serve at once on preheated plates. If you like you could drizzle with some very good extra virgin olive oil. 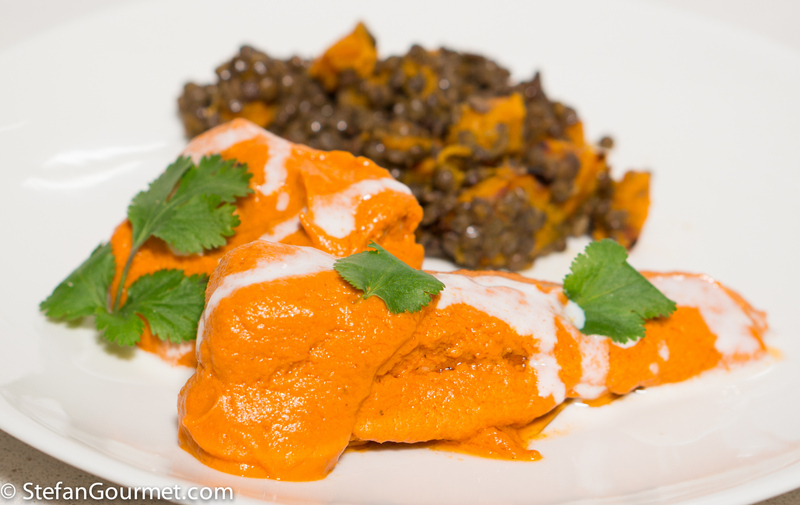 This simple shahi salmon was a souvenir from a trip to India, succulent salmon smothered in a tomato gravy. This type of dish is also indicated as “korma”. You are the second one this week to teach making pasta sans eggs ! The other was Jamie Oliver in his current fabulous series ‘Jamie and the Nonnas’ from which I have probably learned more usable methodology than any other source found . . . So interesting using bay and garlic only . . . must try soonest . 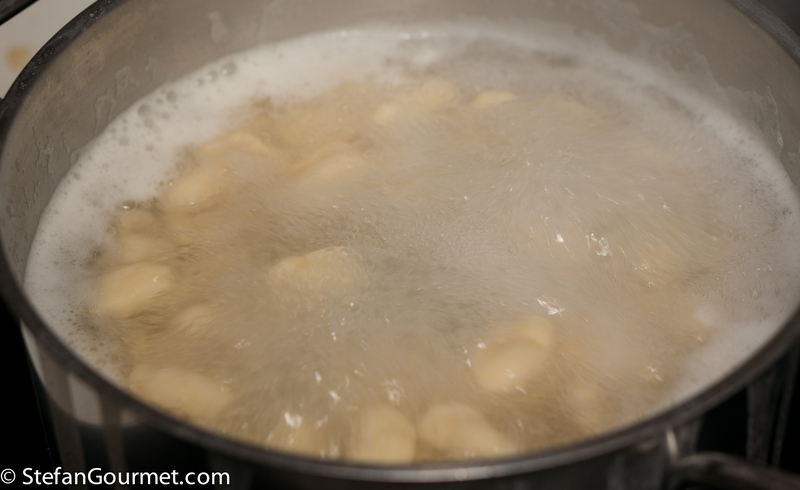 . .
Io non ci provo nemmeno a fare i cavatelli da sola! Sai che in Italia i “mussels” si chiamano cozze, ma in Liguria si chiamano “muscoli”? Sounds similar. Ne vado matta. Sono allevati anche in Olanda? Sì, il 10% delle cozze allevati in Europa sono olandesi, ma sono in gran parte esportate in Belgio e Francia. In Italia i pesci e frutti di mare spesso hanno nomi diversi. Avevo visto prima che le cozze sono anche chiamate i muscoli, ma non mi ricordavo dove. 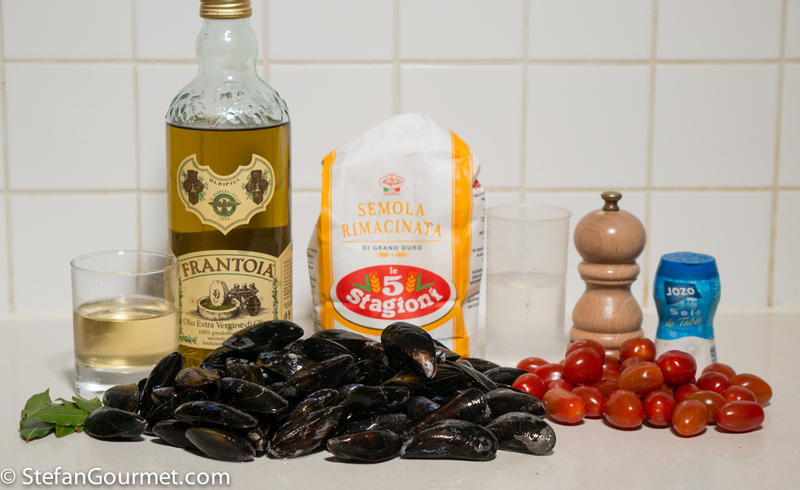 Per me è sempre strano che qualcosa potrebbe essere maschio (i muscoli) e femmina (le cozze). ahah questa cosa del gender è divertente. Vai a capire se una cozza è maschio o femmina!